Wow, I didn't think I was going to get the chance to do it, but I got my second small space done today! My bathroom isn't totally finished yet, but I am thrilled to present you with the before and after photos of my bathroom drawers/cabinet. This is the cabinet before I did any cleaning/organizing in there. It looked like someone just opened the door and started throwing stuff in. Unbelievably, this is everything that was under the cabinet. Seriously. It amazed even me and it's my cabinet. This is the cabinet afterward. Yes, there's almost as much under there, but now it's all put in neatly and I know precisely where/what everything is. 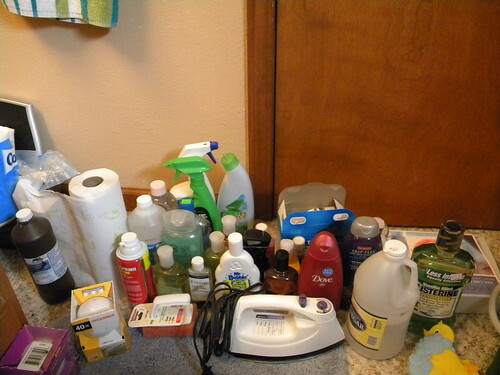 Like items (cleaners, extra bottles of bodywash/shampoo, etc) are with like items and now I can reach right in and find just what I'm looking for. 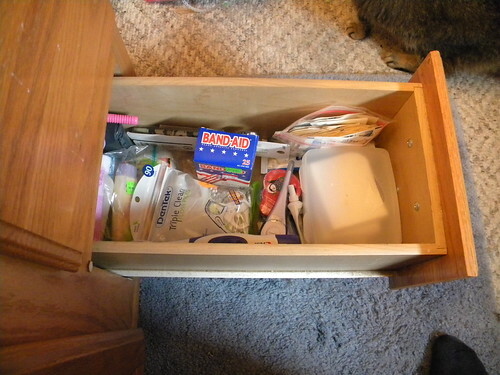 This is the lower drawer before I tackled it. As you can see, again, things were just tossed in there and we could never find anything. This is that same drawer after. There's a ton less stuff in there. 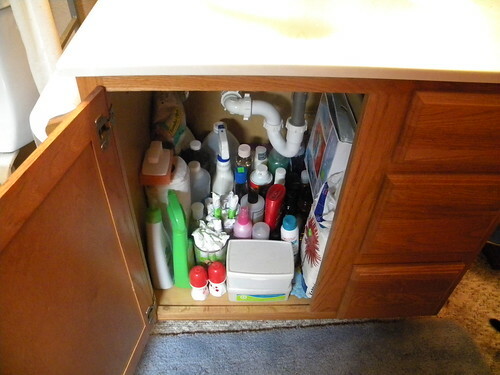 Some of the items (like extra shampoo and nail polish remover) are now under the sink in the cabinet portion. Other stuff is just gone! Now, I have my face cleaner, extra razor blades, thermometers, bandaids and spare toothbrushes stored in there. This drawer doesn't have even half of what it had before in it. This is the top drawer before I touched it. It's also our kitten, Mittens and my toes. Hello toes! As you can see, it was shove full of all sorts of stuff. Yes, this is that same drawer after. 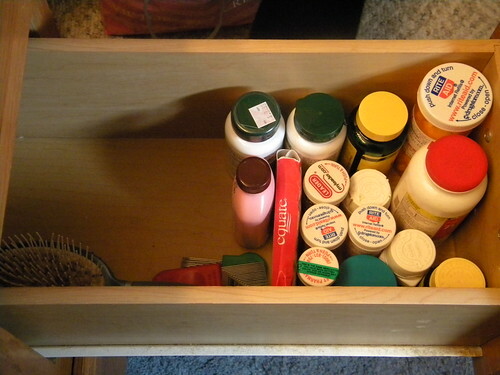 I got rid of all expired medicines and a ton of sample sized bottles of things. 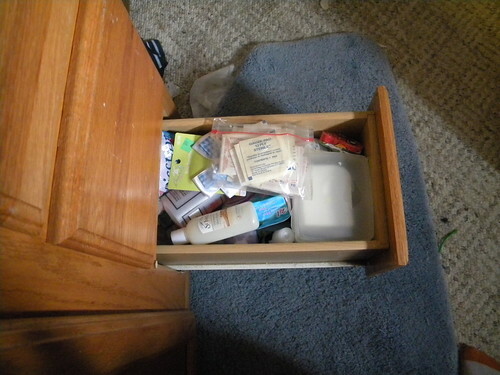 In the lower drawer, I have one ziplock bag with sample sized items for when I travel. 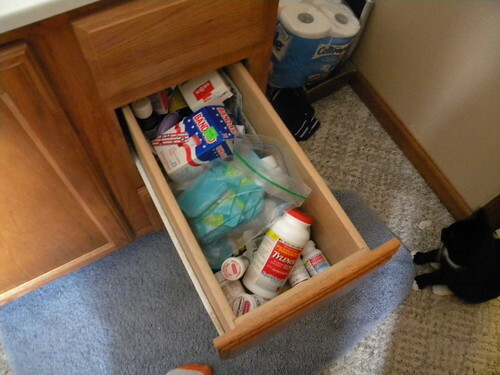 I also had empty bottles in this top drawer. I have no idea why. They're gone now. - The hardest part was honestly just taking the time to do it. I'm a master declutterer but I was using all sorts of excuses for not going in there and doing it. I think it only took 20 minutes once I went in. Looking at the photos, I think I succeeded! - Like with like. I've known this rule forever and it's one that I've always practiced. I'm honestly not sure why, when I originally unpacked this room, I didn't put it into practice. I also got rid of a bunch of stuff that was either expired, empty or we just no longer needed. Less stuff means less clutter. - It went to one of three places: Freecycle (extra samples and usable items), the trash or the recycle bin. - Hmm..I really don't think I did anything really creative in this space. Then again, I don't think it needed it either. It really only needed to be gone through, sorted and either purged or put away. I didn't need additional space, I needed less stuff. - Well, I don't know if I should but I sure would like to. I'm honestly just thrilled that my space is more functional and that I can now reach in and put my hands on whatever it is that we need. Really, that is a huge reward that and the feeling of peace I feel whenever I open one of those drawers. Now, if someone wanted to give me a prize for found peace, I certainly wouldn't complain! It looks great! Nice organizational job! 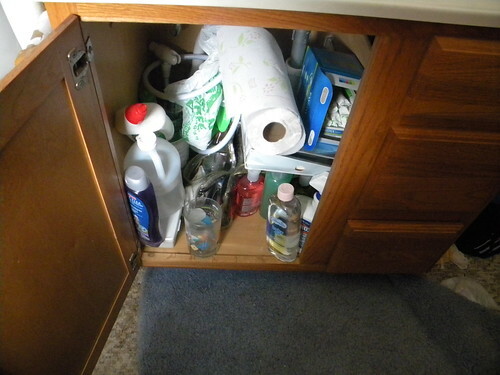 great job...i'm the worlds worst for putting wayyy too much stuff in cabinets...lol, so I know how that feels. You have it all cleaned up so nice though!